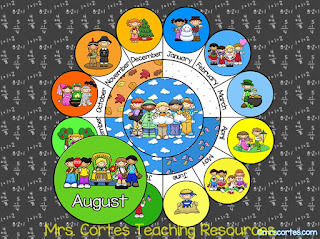 Mrs. Cortes' Teacher Resources: NEW MATH CALENDARS FOR ACTIVBOARD ARE HERE!! NEW MATH CALENDARS FOR ACTIVBOARD ARE HERE!! 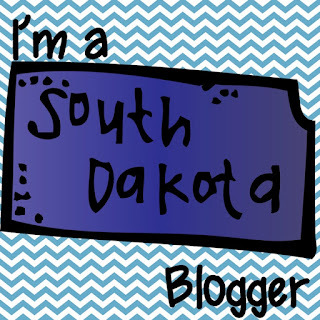 It has been a very busy Summer, between my 2 kids and the new update for my Math calendars I have barely had time to breath!! But after so many long nights the new update for the ACTIVBOARD Calendar Math is here. Although the update will be available for all the usual interactive boards (SMARTBOARD, MIMIO, and EASITEACH) so far I have only uploaded the ACTIVBOARD version of the calendars. I guess some more long nights await for me!! The main change in the calendars has taken place in the graphics. With a better quality and definition these calendars are just adorable, I can't wait to use them with my students this year!! 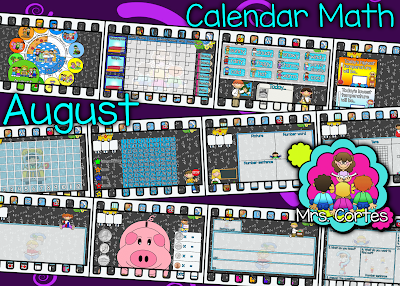 • Monthly calendar with icons to mark special days and birthdays. • Weather graph with graph analysis questions. • 120 Board. Adding and subtracting 1 or 10 to a number. • Time. Interactive clock and blank clock to show the time. • Problem of the Day. Step by step problem solving steps.